Tulkor, Ferocity of Xivu Arath is an Ultra Ogre seen in the mission Broken Courier. It was deployed by the Hive to defend stolen Awoken Artifacts after a successful raid on a Awoken temple. Tulktor will spawn after claiming one of two relics in the Gardens of Esila. The Ogre will bombard the player with Void blasts while Hive adds swarm them. To defeat the boss, players simply need to heavily damage it until dead, in which they could claim the second-to-last relic of the Broken Courier mission. 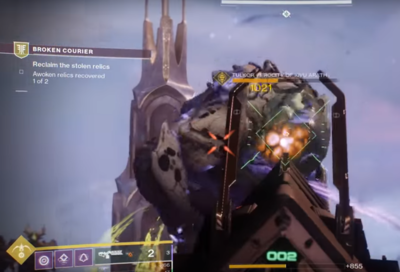 Tulktor can be killed one-shot by supers including a Hunter's Blade Barrage. Tulktor means "tulip" in Persian.